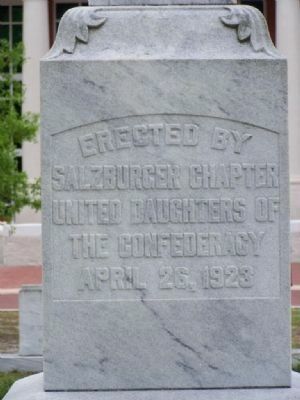 Erected 1923 by Salzburger Chapter United Daughters Of The Confederacy. Location. 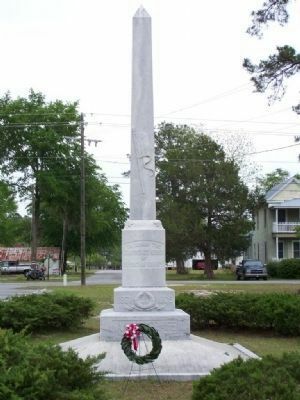 32° 22.411′ N, 81° 18.828′ W. Marker is in Springfield, Georgia, in Effingham County. Marker is on North Oak Street near Jackson Street, on the left when traveling east. Touch for map. Marker is in this post office area: Springfield GA 31329, United States of America. Touch for directions. (approx. 1.4 miles away); Old Ebenezer (approx. 3.3 miles away); Jerusalem (Ebenezer) Church (approx. 4.2 miles away); Bethany (approx. 4.8 miles away); Pilgrim Missionary Baptist Normal and Industrial Institute (approx. 5.4 miles away). Touch for a list and map of all markers in Springfield. More. 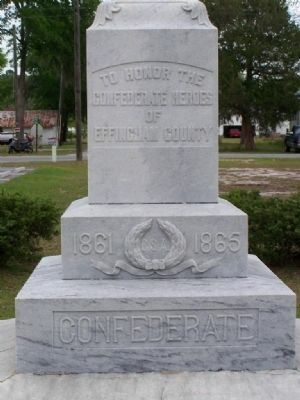 Search the internet for Confederate Memorial. Credits. This page was last revised on June 16, 2016. This page originally submitted on May 1, 2008, by Mike Stroud of Bluffton, South Carolina. This page has been viewed 1,469 times since then and 14 times this year. Photos: 1, 2, 3. submitted on May 1, 2008, by Mike Stroud of Bluffton, South Carolina. • Craig Swain was the editor who published this page.